This is a regular blog post. If you’re looking for show notes or links to show audio, please see the other entries. Mary took the kids to DC this past weekend. She, Cole, and Ella are big Obama fans. I maintain neutrality for purposes of the show in order to keep it all about aviation. But it’s very cool to see Cole, especially, so excited about government and the leadership of the country. Whatever your persuasion, there’s a definite feeling of Camelot in the nation’s capital and there’s something to be said for giving kids an optimistic experience of this kind early in life. 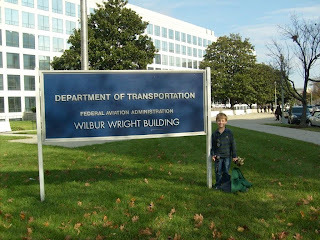 Mary got this shot of Cole posing outside of our favorite aviation regulatory agency. 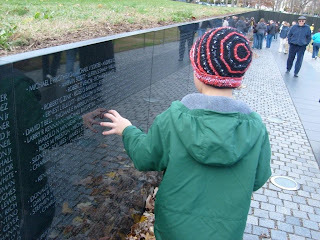 The spent some time over by the Lincoln Memorial and the Vietnam Veterans’ Memorial in the course of the day. 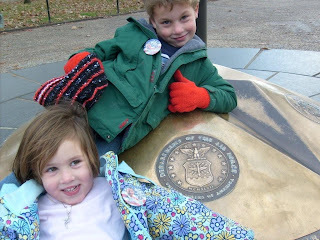 Cole recognized the Air Force seal on this monument and wanted a picture with it. No doubt where the boy’s loyalties lie, that’s for sure! And we close with this picture. We could all go on and on with scripts of what’s going on in Cole’s head and whether he understands what he’s seeing. Do any of us who weren’t there understand it? Enough said.